True love: The Answer to Insomnia! I’m guessing it’s more related to the hell of a night he went through and finally got tired enough. Buuuut, your’s is a good option as well, hahah. 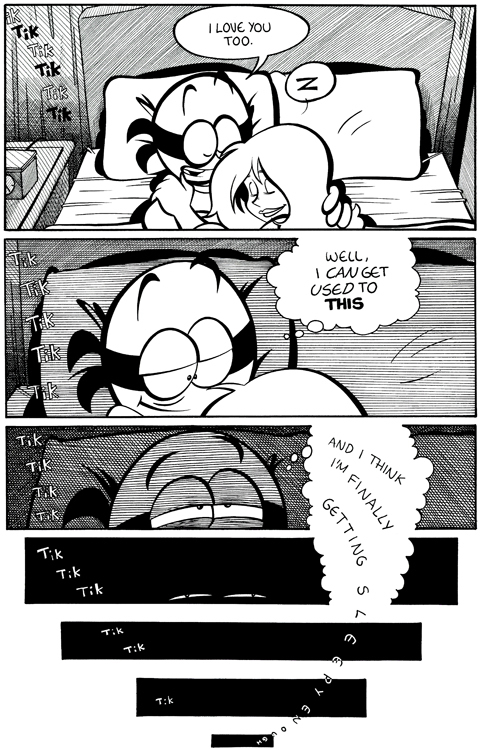 Well, now I KNOW the next page will have him being woken up two seconds later due to those “tik, tik, tik” sounds from the alarm clock. It’s the bad thing about doing the live streams, kinda spoils the further pages. Yes, to wake him up you indeed are a sadistic, cruel, heartle- I mean, do you have to, really?! Sad thing is, yes, muahahaha!